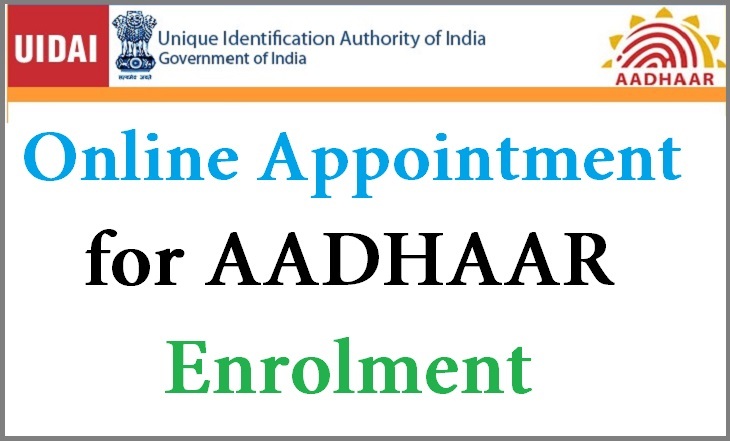 Here is the information on how to book an appointment for aadhar card enrollment in online and where to book an appointment for aadhar card enrollment in online. 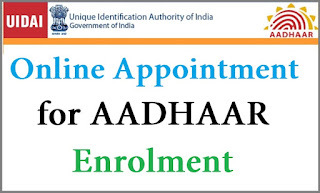 Aadhar card online registration process is also available, one can apply for aadhar card online or apply for new aadhar card online.To register appointment the following is the process. aadhar card online registration and apply for aadhar card online, we need to book an appointment for aadhar card apply. Unique Identification Authority of India on behalf of Government of India started online booking of appointment for the Aadhaar enrollments.This online booking feature available to the people from states Andhra Pradesh, Bihar, Chandigarh, Delhi, Gujarath, Haryana, Himachal Pradesh, Jharkhand, Karnataka, Madhya Pradesh, Maharashtra, Punjab, Rajasthan, Telangana, Uttar Pradesh, Uttarakhand. With an appointment Minimum, 1 to maximum 4 people can enroll for aadhar card, while booking one need to choose the number of persons as per the count of family members/or group of persons would like to enroll for Aadhaar card. Now we can easily Book an Appointment for Aadhar Card Enrollment in online follow the given Procedure to book an appointment for aadhar card enrollment. When you fill your details and choose the enrollment center details the page will ask you to opt for date and time for the appointment, the page will show you available slots on selected date and time.If you find available slots zero you can go for the next time slot in same day/next day available time slot based on your own convenience.Once filling up all the details and opt the time slot one can click on the fixed appointment this page will navigate to the webpage where you find the token number, and this will be used for the future reference. Have you fixed appointment? and unable to visit the enrolled center at the time, no worries! The feature for Enrollment Reschedule/Cancel is also available, using a token number and registered mobile number one can reschedule or cancel the appointment. Are you looking for the assistance in registering appointment online for Aadhaar enrollment? Well, here you get the complete process with snapshots to get an idea on how to book an appointment for Aadhaar Enrollment. Check here for aadhar card enrollment places near by you...then visit that place for new aadhar card enrollment.